Also the Democrats are hiding because if the economy comes up again as a negative AND it will, then it shows they aren't doing their job and thats not good in front of the election 2012. Once again another slippery slope but this one is self-interest via the Democrats who should have been hollering for a JOBS BILL and that bill HR 870 that Conyers introduced. Patriot wrote: Also the Democrats are hiding because if the economy comes up again as a negative AND it will, then it shows they aren't doing their job and thats not good in front of the election 2012. Once again another slippery slope but this one is self-interest via the Democrats who should have been hollering for a JOBS BILL and that bill HR 870 that Conyers introduced. Yep, most of them sure are being awfully quiet lately. doreenb wrote: Maybe we need someone famous to speak out for us!!! A celebrity spokesperson would sure help..
mrgolf wrote: A celebrity spokesperson would sure help..
We won't be getting any airtime there because her show is over. What she did for beef would have been great for the 99ers. Oh well. concernedinKY wrote: My opinion? We need to contact the Democrats and tell them that the 99ers MUST be part of any negotiations regarding the budget. Boehner has to have Dem support to get that monster going and a shutdown would be politically bad for him. 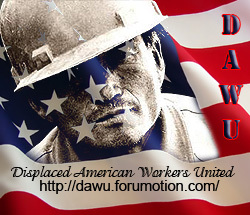 I am writing you today on behalf of the millions of long term unemployed in America, the 99ers. In the coming weeks, there will be much back and forth going on over the federal budget. The Republican side knows that they can't accomplish this without YOUR support and the 99ers need your help now. These vulnerable citizens, the ones hit the hardest by this recession, were left behind when the tax cut deal was struck in December. Their numbers are growing to frightening proportions and that doesn't even count the number of children that depend upon them for survival. Do not let these citizens down again. H.R. 589 and H.R. 1113 MUST be a part of any deal struck regarding the budget in order to give these citizens a chance to get back the American dream. There are currently 75 Democrat co-sponsors of H.R. 589. And not one Republican has committed to co-sponsor this bill. Yet in the House of Representatives there are 193 Democrats and 242 Republicans. So 75 Democrat cosponsors is a drop in the bucket. So besides contacting our Republican representatives we need to still work on the Democrats as well. This is our one chance to get extended unemployment benefits for the 99ers. Lets not blow this chance. Lets put every effort into contacting both our Democrat and Republican Congressmen and urge them to cosponsor this bill. Remember Reps Barbara Lee and Bobby Scott requested our help to get their bill passed in the House. Once it passes the House and goes to the Senate it will be a whole new ball game there with the Democrats in the majority in the Senate. The hardest battle is getting support for this bill in the House were the majority are Republicans. So please keep contacting your Congressmen. We must not let up if we want to win this fight for unemployment benefits. Below is the link to the site that lists the contact info for every Congressman. Like I have always said here and on the original UF, never give up. It can happen at any moment but we can't stop fighting for it! game there with the Democrats in the majority in the Senate. Just a head's up that the American 99ers Union site has been updated. Nothing earth shattering there. But do please contact Boehner, et al and most importantly your own 2 Reps (AGAIN!) now that 589 is at least getting some discussion. And suggest that the Dems look very hard for a way to pay for this! Something that the Republicans can't object to, like money found in pork barrel projects or wasted spending or etc. They have to think outside the box for us! pdsnickels wrote: Just a head's up that the American 99ers Union site has been updated. Nothing earth shattering there. But do please contact Boehner, et al and most importantly your own 2 Reps (AGAIN!) now that 589 is at least getting some discussion. You did mention it. It was in another thread. That is right there are soon to be more unemployed added to the 99ers group. As the unemployed go through each tier, they eventually wind up joining the ranks of the 99ers. Plus I read more businesses are failing and laying off workers, like General Motors will soon do. And then there will be more applying for benefits till this unemployment problem snowballs out of control. That is unless something is done about it and done ASAP. Just these high gasoline costs will put a new burden on business owners and cause less hiring.